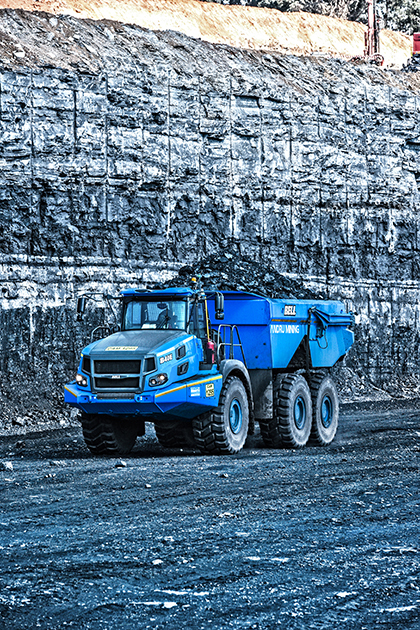 Having ten new Bell B40E Articulated Dump Trucks (ADTs) doing the same production as twelve older ADTs at a coal mining contract may seem like a dream but this is exactly what a Gauteng-based contract miner has found. Andru Mining, distinguished in the South African mining industry by its blue mining equipment, has been around since the late 1970s when it was founded by civil engineer, Terry Troughton. Day-to-day operational control has since been passed onto a new management team consisting of Joe Naicker, the Plant Director, Anthony Wardlaw, the Operations Director, Shonel Reddy the Financial Director and Branden Bowen who is the Commercial and Human Resources Director. The company works exclusively in opencast mining contracts, servicing clients in the coal, gold, chrome, silica and fluorspar industries. Since acquiring its first Bell B20B ADTs in 1996, Andru Mining has owned many Bell machines and has steadily grown its fleet through the 20, 30 and 40-ton ranges. Of the 34 B40E ADTs, 10 were fitted with the newly designed Bell coal bin, which allows the truck to easily fulfil its design capacity of carrying between 36 to 39 tonnes of raw coal. Delivery of the new fleet of Bell B30E and B40E ADTs took place during April, May, June and July 2018 and most trucks were delivered straight to their respective mining sites from the Bell Equipment Richards Bay factory. Andru Mining’s new Bell B30E and B40E ADTs have been bought with the standard 12-month warranty with unlimited hours - a fact which the company feels works in its favour as utilisation on especially coal mines is high. Coal production demands high mechanical availabilities and the Bell B40E ADTs run on average for 20 hours in a 24-hour cycle. Joe is adamant that even when their new Bell E-series ADTs have exceeded their warranties, Bell Equipment would still be asked to undertake all 1 000-hour services to ensure each machine has a clean bill of health to ensure maximum uptime. 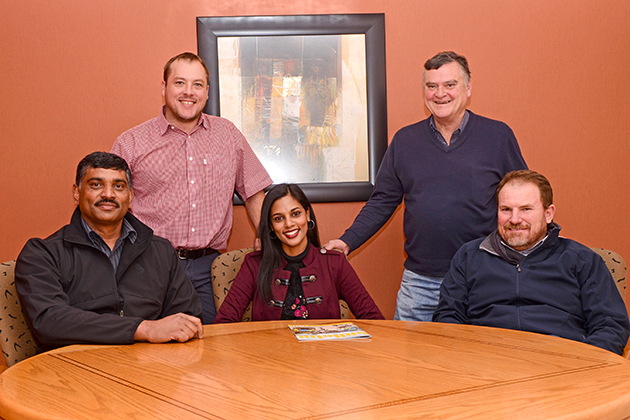 (Back left): Branden Bowen (Andru Mining Commercial & HR Director), Vernon Johnstone (Bell Equipment Sales Representative); (front left): Joe Naicker (Andru Mining Plant Director), Shonel Reddy (Andru Mining Financial Director) and Anthony Wardlaw (Andru Mining Operations Director). 2019 © Copyright. Bell Equipment. Todos los derechos reservados.